Learn ‘Big Data Visualization Storyboarding and Wireframing Techniques’ like never before! As you all know, we live in an era where ‘Big Data’ has indeed become an important core component in every industry. When data is used to its full potential, companies can maximize their marketability, generate more revenue, and even create disruptive innovation. However, to be effective, it is critical that the data be presented in a manner that users can easily analyze and interpret. Data visualization storyboarding and wireframing techniques are just some of the key strategies needed to start building effective visuals for your organization. The 4 most critical sections that all successful BI Storyboards must have, but 80% of users don’t even know exist! Yes that is correct! You will learn about the 4 key areas that we include on all 400+ dashboards that we have built, and how to start using them! Which free tool you should be using to build your dashboard wireframe to make the process painless! There are over 40 in the market… we will show you our top 3. Remove the guesswork! How to easily create dashboard wireframes that will WOW your users and gain sign off 80% faster. No more struggling through design discussions. No need for a designer. This one tip alone we’re told is worth the entire course! You get the chance to instantly download some BIDF wireframe templates to use immediately! Our last two BI Dashboard Mastery workshops had well over 1200 registrants, so don’t wait last minute to claim your spot! Mico Yuk, Founder, BIDashboardFormula.com | Author, Data Visualization for Dummies (Wiley, 2013) | BI Coach | Global Keynote Speaker| Top Analytics Blogger (2012) | Co-Founder, ‘Xcelsius Gurus’ Network & EverythingXcelsius.com. To find out more about Mico, visit http://micoyuk.com. About a month ago, Mico hosted her highly rated KPI gathering and scoping techniques webinar, where she demoed the BIDF Blueprint and shared never seen before techniques. Feeling bad that so many folks missed out on the ‘time saving’, ‘wow your users’ type techniques, we decided to do it once again! Yes! You read correctly, Mico will be hosting the webinar again! This time however, it will only last for an hour, but Mico will cover 3 key points that you will not want to miss! The 3 most important tweaks you should be making to your BI Dashboards in 2014. How to easily create a dashboard wireframe that will WOW users and gain sign off 80% faster. We’ll show you the free tools to use to make this process painless. Soo Tang Yuk (@sootangyuk) is the ‘Xcelsius Gurus Network” community manager and evangelist. To find out more, please visit her aboutme page. Join Mico Yuk at #IBIS2014 in Carlsbad, CA on June 15 – 18! Join Mico Yuk at IBIS 2014: Limitless BI 2.0 in Carlsbad, California, June 15-18, 2014. This premier SAP BusinessObjects conference offers 3 days of hands-on boot camps, seminars, workshops, and case studies on BusinessObjects Web Intelligence, Xcelsius/Dashboards 4.x, Data Services, Crystal Reports, Migration, and much more. This year Mico is heading a half-day, interactive hands-on workshop, described as ‘eye-opening’, at the pre-seminar on Sunday afternoon focused on ‘intelligent’ BI dashboard design. This non-technical, three hour hands-on workshop will provide attendees with the foundation needed to make their analytics more impactful! Whether you are a beginner or a dashboard veteran, this fun filled workshop will take you through the fundamentals of dashboard design and then all the way into real world applications. Team Exercise: Do you see it? – Each team will be assigned a set of dashboards and asked to identify areas where improvements can be made to make it more intelligent and impactful. Team Exercise: Can you apply it? – Each team is asked to then take their recommendations and apply it to one of the dashboards presented. Attendees should have been exposed to, hosted, or participated in at least one full BI project before attending course. Newbies are welcome, but are warned to keep their seat belts on. With less than 3 weeks left and limited space, don’t wait to register for this compelling learning experience in designing effective BI dashboards and data visualizations. Soo Tang Yuk (@sootangyuk) is the ‘Xcelsius Gurus Network” community manager and evangelist. To find out more, please visit her about me page. [Free Workshop] How many of these 5 common mistakes are you making with your Dashboards? Here’s the reality guys, 8 years, 500+ dashboards and 5K+ students later, I’ve finally been able to put my fingers on which mistakes 98% of people make when working with users to create their dashboards. About 3 weeks ago, I taught my highly rated session: Mastering the Art of Dashboard Requirements Gathering and Prototyping, at BI2014. As usual, the time allotted for the session wasn’t enough and I had to skip revealing these 5 common mistakes. However, on April 30th, during a Free 2-hour live online event: BI Dashboard Mastery 1.0 I will complete my BI2014 session by revealing this 5 common mistakes. 1) The 3 most important tweaks you should be making to your BI Dashboards in 2014. 2) Why focusing only on these four key aspects of your KPI’s will determine whether or not your project is successful. 5) How to easily create a dashboard wireframe that will WOW your users and gain sign off 80% faster. We’ll show you the free tools to use to make this process painless. I will also be demoing one of my ‘Cheat Sheets’ and making a long awaited announcement! See you there! Interactive Business Intelligence is all about delivering information in a way that end-users can actually use. This means getting BI to speak the users’ language rather than following the failed ad-hoc BI mantra of trying to get end-users to adapt to generic BI tools. The old phrase “users don’t know what they want until they see it” all too often becomes “users don’t know what they want until they use it”. This is why involving end-users in the design process for interactive BI is essential. This is a key learning point from Mico Yuk’s BI Dashboard Formula (BIDF) and has been baked into Antivia’s new, next-generation BI design tool – XWIS DecisionPoint. 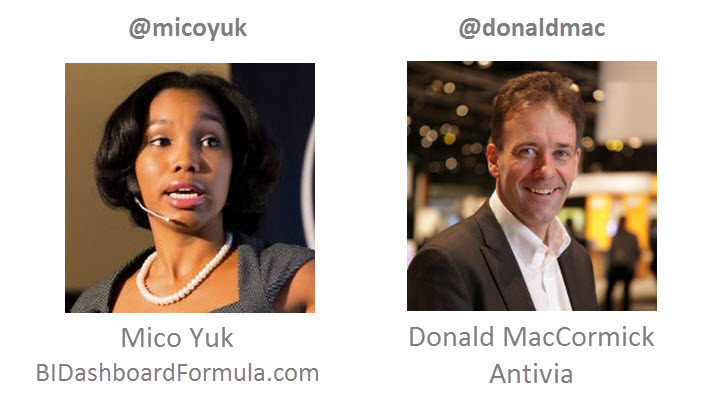 Join us on October 3rd to hear from Mico and Antivia’s Chief Product Officer, Donald MacCormick, two of the BI industries leading thinkers on how to make your BI projects more successful through collaborative design. Don’t miss out! This fun ‘eye opening’ webinar is guaranteed to give you a different perspective on how to make your BI projects more successful. It’s been a looong time coming folks, but myself and Ryan Goodman are hosting the 1st ever #AllAccessAnalytics webinar of 2013 with Steve Lucas, President of SAP Platforms. Join us as Steve introduces his ‘BOLD’ new SAP Analytics roadmap for the first time this year and provides insight into plans for the agile/visualization category, the upcoming BI4.1 migration website, and much more! IMPORTANT NOTE: Though the name of this series has changed, the format has NOT! This is the only webcast for the community where you are 100% in control! Usual rules apply. SAP is not allowed to market, all questions are in scope = you get pure NO BS content! Our record attendance numbers allow us to do these webinars for FREE, so please help us by spreading the word using the #AllAccessAnalytics hashtag on twitter, sharing via email, Facebook, LinkedIn or word of mouth!! Be sure to enter your comments or questions during registration (those will be sent anonymously to SAP) and also be sure to show up early as we have 500 slots and average of 1,200+ registrants. Register here: http://bit.ly/AAAShows. Mico Yuk is a SAP Mentor Alumni and SAP Analytics Influencer, founder of the Xcelsius Gurus Network, the Everything Xcelsius blog and BI Dashboard Formula. To and also learn more about her, please visit her about page. I’m so excited to be attending BI2013 in Las Vegas, March 19-22. I’ll be presenting 3 sessions, two of which are new (watch video to find out!). If you are having trouble viewing the video, please click the direct link: http://goo.gl/Jnp5y. To view more details about my sessions, please click here: http://bit.ly/ZhCNan. If you can’t attend, I will also be tweeting & taking many pics, on twitter and instagram using #BI2013 hashtag! Hope to see all of you there! Mico Yuk is a SAP Mentor Alumni and SAP BI Influencer, co-founder of Benchmarkers Business Intelligence and founder of the Xcelsius Gurus Network, the Everything Xcelsius blog. To learn more abut her, please visit her about page. Big thanks to Everyone that registered for the webinar last week, ‘Learn One Shocking New Way to Increase BI User Adoption’. To find out what these attendees were raving about, just sign up for Free access to our BIDF Members Portal (no cc requ), or if you already have access to the portal, just signin with your username and password, then click on “2013 Free Webinars” on the main Dashboard. Based on the attendees’ reaction, I promise, this is a webinar you don’t want to miss! Join Mico Yuk (@micoyuk) again for another ‘eye opening’ webinar, guaranteed to save you time and money on your BI projects. REALITY… Regardless of how hard you work on your BI project, the success of the project will be determined by one single KPI? You learn to use her one secret technique! This new, but effective method of launching your BI project will make all the difference in the world to your business users. Results? – your business users won’t be able to wait to try your BI product! Your team will leave feeling appreciated and ready to for the next challenge! She has never shared this before, so you’ll simply have to attend to see what it is and how it’s done. Register for another Special FREE Webinar today! Don’t miss out! This fun ‘eye opening’ webinar is guaranteed to give you a different perspective on how to successfully approach your BI projects in 2013. P.S. 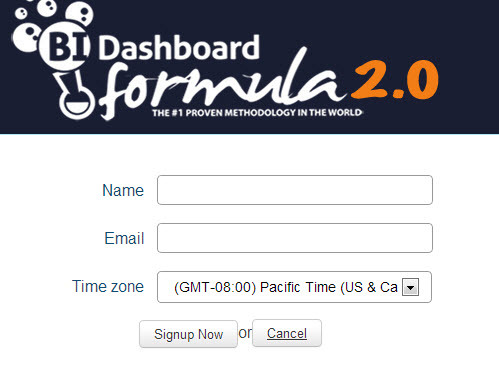 – Registration for the BI Dashboard Formula will shut down in 7 days! Don’t wait… Register Today! We would like to say thanks to everyone that registered for the webinar last week Thursday with Mico Yuk. As promised the recording and slides are available for those who couldn’t attend. 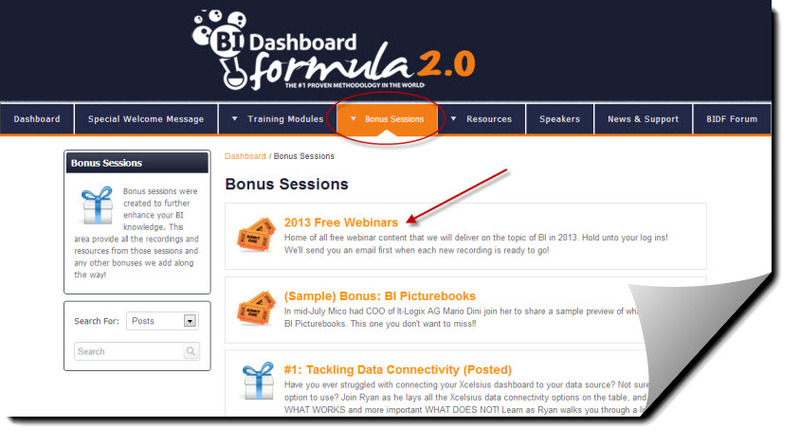 To watch the recording and slides, just sign up for FREE access to our BIDF Members Portal (no cc requ). Signing up for the portal, gives you access to lots of free resources, including: presentations, webinar, templates, and much more! There were also many questions asked that Mico could not answer during the webinar, so below the video are her top 5 questions with answers. Don’t miss out out! Click here to view the recording now! P.S. - Tomorrow is the last day to use the ‘micobuddy’ coupon to save 10% on your BIDF 2.0 Registration. Class is almost full. Click here to Register now! Interested in hiring one of our Gurus? Need help training your staff? Not sure where to start building your dashboard? We can help. Contact us to find out more! 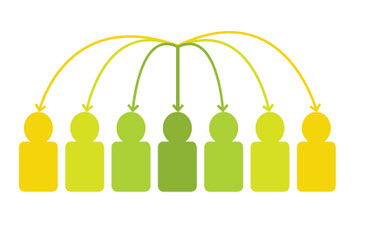 The Everything Xcelsius Weblog is the fastest growing Xcelsius community on the web! It is a place where developers and clients alike can come to gain more information about SAP Dashboard (Xcelsius) software.